Khalid en Ibrahim El Bakraoui, verdachten van de aanslagen in Brussel. As Belgium on Wednesday morning marked 24 hours since Tuesday's horrific bombings in the EU capital city of Brussels, security forces are continuing a frantic search for the third terrorist who took part in the lethal attacks at Zaventem Airport. A full 34 people were murdered and around 250 wounded in the twin blasts at the airport Tuesday morning, as well as in another explosion an hour later at Maalbeek metro station, located right near the EU headquarters. Islamic State (ISIS) has claimed responsibility for the slaughter. Belgium is currently holding three days of mourning, and a minute of silence will be held on Wednesday at midday. 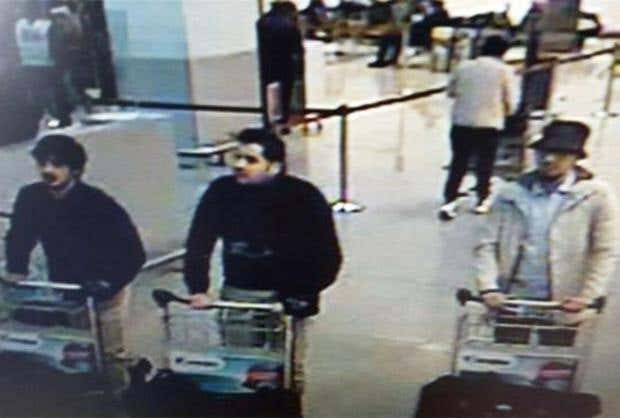 The two suicide bombers who hit the airport were identified by Belgian authorities on Wednesday morning as the El Bakraoui brothers, who were known to police. In light of the tense security situation, the US State Department has warned US citizens regarding the "potential risks" of travel in Europe. The State Department said in a statement that terror groups are planning "near-term attacks throughout Europe, targeting sporting events, tourist sites, restaurants and transportation." Police currently are engaged in an intensive manhunt, trying to track down a man caught on security cameras together with the two suicide bombers at the airport. He was seen wearing light-colored clothes and a hat while walking with the two who were dressed in black, as all three pushed baggage carts. The two are thought to have detonated explosions in the airport's departure lounge. Investigators say the third terrorist likely planted a bomb at the airport and then left, although his explosive failed to detonate. "The third man left a bomb in the airport, but it didn't explode. ...And we are now looking for this guy," Belgium's Interior Minister Jan Jambon said. All three men were caught on security cameras exiting a taxi and walking through the airport according to two US officials cited by CNN. The third terrorist left the airport shortly afterwards, which the officials said appears to have been a pre-planned move. A lead in the search came from the taxi driver who took the suspects to the airport. He contacted police after seeing the CCTV images, and told them where he picked the three up, according to the US officials. 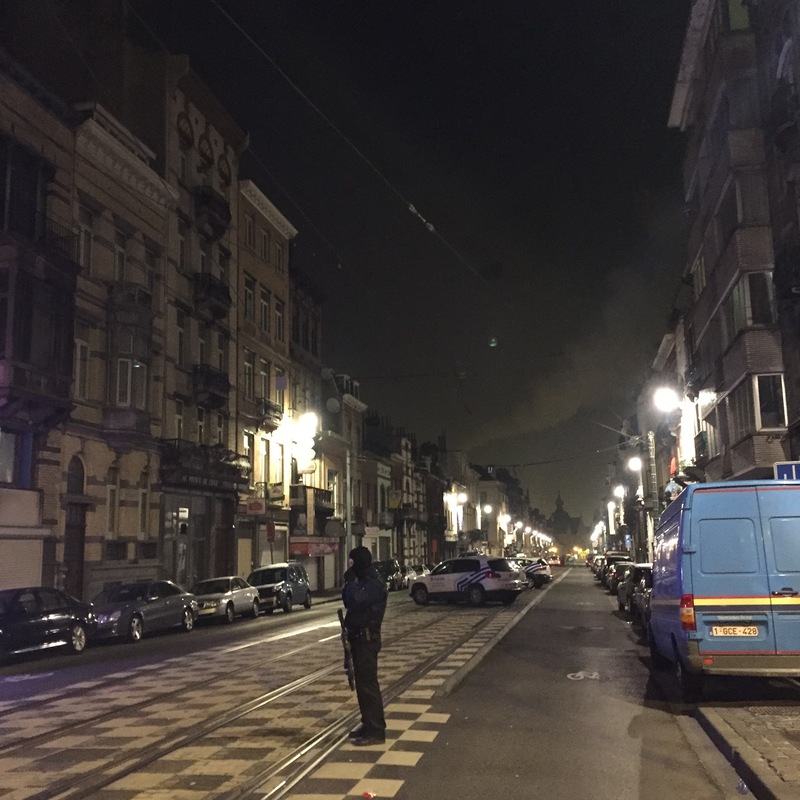 Based on that information authorities raided an apartment in Schaerbeek, a suburb of Brussels to the northeast, where they found a nail bomb, chemical products, and an ISIS flag. Their search in the building continued for hours, but it remains to be seen if any thread to track down the elusive bomber was unearthed. The fugitive suspect from the airport attack was named by police as Najim Laachraoui, and according to reports he is a bomb maker for ISIS. He is said to have been wanted by police ever since the ISIS attacks in Paris last November. Khalid and Brahim El Bakraoui of Brussels were known to police for their criminal records but had not been tied to terrorism until now, a source told the local RTBF as cited by Reuters. Under a false name Khalid rented an apartment in the Forest suburb of Brussels where police killed a gunman during a raid last week. An ISIS flag, an assault rifle, detonators and a fingerprint of Salah Abdeslam were found in the apartment. Abdeslam, who was arrested three days later, was a key terrorist in the ISIS attacks on Paris last November in which 130 people were murdered. The finding would seem to solidly link the Paris and Brussels attacks, a connection that has yet to be officially declared. The two suicide bombers who carried out the deadly attacks at Brussels airport on Tuesday (22 March) were linked to last November's attacks in Paris, according to the Belgian state broadcaster. Radio station RTBF said the airport attack was carried out by brothers Khalid el-Bakraoui, 27, and Ibrahim el-Bakraoui, 30. Police had been hunting them since a raid on an apartment in the Brussels suburb of Forest, which led to the capture of Saleh Abdeslam, the sole survivor of the team involved in the Paris attacks. Khalid el-Bakraoui is believed to have rented the Forest apartment under a false name, and the brothers reportedly supplied ammunition and weapons for the Paris attacks. The suspects had spent time in prison, according to RTBF, but not for terrorist offences. Ibrahim el-Bakraoui was sentenced to nine years in prison in 2010 after shooting at police officers after he attempted to rob a currency exchange office. Police in Belgium reported on Wednesday that they had recovered a computer belonging to one of three suicide bombers involved in Tuesday's deadly attacks in Brussels, AP reported. The device, which was found in a trash can in the Schaerbeek neighborhood of Brussels, belonged to Ibrahim El Bakraoui, who set off a bomb in the waiting lounge of the Zaventem airport. At least 12 people were killed in the twin blasts at the airport, which also killed the bombers, Ibrahim El Bakraoui and his brother Khalid. El Bakraoui had a lengthy police record, but no history of terrorism prior to Tuesday's attacks. Belgian media outlets reported that ISIS material was found on El Bakraoui's computer, bolstering suspicions that they attacks were coordinated by ISIS. Police released some tantalizing clues found in a note written on the computer shortly before the attacks. Described as a sort of last will and testament by the terrorist, the document provides further evidence that the terror cell responsible for Tuesday's attacks in Belgium were linked to the terrorists involved in November's terror attacks in Paris. The document, which appears to have been written quickly just prior to the attack, reveals that El Bakraoui feared arrest for his activities, suggesting that ongoing investigations into the Paris attacks were likely to unearth his terror ties. In the note, El Bakraoui said he was "in a rush, doesn't know what to do" and that felt "surrounded by all sides." Claiming that he was "hunted everywhere", El Bakraoui wrote that he "doesn't want to end up in a cell next to him", an apparent reference to Salah Abdeslam, the terrorist involved in the Paris attacks who evaded police for months. Abdeslam's arrest just four days before the Brussels attacks appeared to have triggered El Bakraoui's fears and may have been the catalyst for Tuesday's attacks.